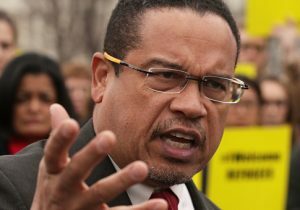 Rep. Keith Ellison (D., Minn.), deputy chair of the Democratic National Committee, suggested Monday that America has the same moral imperative to accept illegal immigrants that countries before and during World War II had to accept Jews fleeing Nazi Germany. "I heard today that as many as three million DACA recipients live with someone who is a citizen of the United States," Ellison said during a speech in Minneapolis. "Add that to the people who work with a DACA recipient. Add to that people who are the parents of a DACA recipient. Add to people who are parents of American citizens." Ellison then claimed there are over 100 million Americans who are "deeply connected" to people who have immigrated to the United States. He emphasized those who receive protections from the Deferred Action for Childhood Arrivals program, which the Obama administration put in place to provide legal protections to illegal immigrants who came to the United States as minors. Ellison blasted the Trump administration's decision earlier this month to rescind DACA and called on the audience to "fight" for the program's recipients. "This is not someone else's fight. This is all of our fight, but some people are in the bullseye and others of us are not exactly the target," Ellison said. "Therefore, it is our responsibility to stand up, fight, and do the right thing. Ellison then compared illegal immigrants to European Jews who tried to escape Nazi Germany's attempt to exterminate them, arguing the U.S. should give its neighbors sanctuary instead of deporting them. "And if you ask yourself, ‘What would I do if was a Gentile in 1941, if my Jewish neighbors were under attack by the Nazis, would I give them sanctuary?' You might be about to find out what you would do," Ellison said. "Will you pass that moral test or will you fail it?" Ellison asked. He said this is the time for people with faith and belief in their hearts to stand up and demonstrate it. Ellison's speech came hours after House Minority Leader Nancy Pelosi's (D., Calif.) press conference was disrupted by so-called Dreamers who shouted that Democrats had created an "Out of Control Deportation Machine." Ellison did not address his previous anti-Israel rhetoric when he said, according to reports, that Jews want to "oppress minorities all over the world."